I've heard about this thing called "Foursquare" for quite some time. An app that allows you to "check-in" at places you visit. I honestly thought the concept was pretty useless. Like who would care where I was or why would I even want to tell anyone? But one day I decided to give it a try. Well, I'm hooked. The iPhone app for Foursquare is really smooth and constant updates make it better and better. It only took a minute to sign up for an account, and another couple minutes to link it to my Facebook and Twitter accounts (optional). I used my Facebook account regularly, but had little need to use Twitter very often. Foursquare has given my twitter account new life because now when I "check-in", I have it automatically post to Facebook and Twitter. It's seamless. My wife and two children also have iPhones, so I got them all hooked on using Foursquare now. It was probably peer pressure, or simply curiosity, or maybe even a sense of belonging that got them using it, but they're hooked now too! They would see my check-in's from whatever store, restaurant, or random place we were at and eventually just had to "check-in" too! Like many social media applications, it becomes pretty addictive. I really like that I can update foursquare, Facebook and twitter in the same step, so it saves me a bunch of time. The status update that the Foursquare application posts to my Facebook page is really nice. It's a small map thumbnail with a pin on my location (see picture). 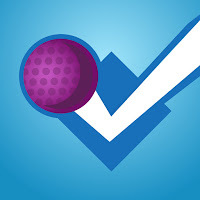 If you check in the most at a certain location, Foursquare awards you with a Mayor status for that location. It's a fun way to compete with friends or family. You can also get award badges for obtaining certain milestones with Foursquare, like "adventurer badge" or "explorer", etc. These are also fun to achieve and inside the app is a little billboard of all your badges and empty spots for available ones. This gives you something else to strive for. So basically it's addicting as all hell and if you've got a smartphone, you should give Foursquare a try. They also recently added "nearby specials" to the app which shows you local places that give you discounts if you simply check-in at their location. A fun and easy way to save money. I'd have to say the coolest part for me is ousting someone as Mayor and becoming the Mayor myself. 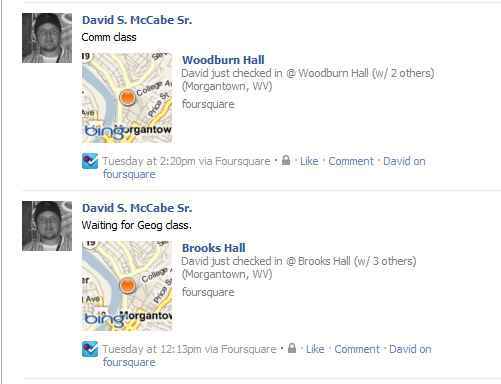 The next coolest part is being able to post messages with the check-ins (Facebook and Twitter). So let's say I checked-in at a local club. I could say something like "I'll be here for a few hours, stop by for drinks!" This gives your friends an opportunity to meet up and hang out. Cool stuff. 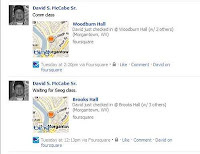 Sure you could just post that on Facebook, but foursquare will show a map of the location, give you points, post to twitter at the same time. So if you have all three apps, you only need to update one to update all three. My family and I are fighting for Mayorships of all the same places since we check-in at all the same places. It's a blast. Four square seems like a cool concept to me but I dont need another reason to be glued to my iPhone. Maybe you would like the Field Agent app too ..its like getting paid to check in, sort of.